So. She's got a Halloween or two under her belt already. Good! She's well on her way to becoming a seasoned veteran of the Halloween season, an expert costume wearer, and a master of acquiring the most trick-or-treat candy. But, we still obviously have to foster her growth as a Halloween expert. So, let's get to picking out that costume. Maybe she was cute and cuddly for her first couple costumes, something delightful like a dragon or a princess. That's great, but she'll need to round out her costume repertoire with more experience. Something a little spooky, but not too spooky. Halloween is supposed to be scary, after all, and while princesses are welcome, haunted specters rule the day (er, night)! 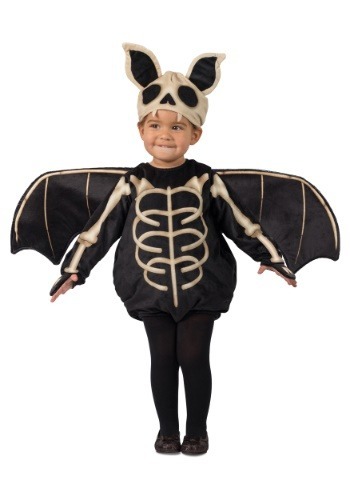 So, a natural costume progression and a totally awesome choice would be this Toddler's Skeleton Bat Costume. A creature that may have come out of a haunted house or a spooky cave, she'll be dressed like a little flying skeleton, complete with a skull and wings. But, nah, we don't think she'll be too scary. We're sure of that because we'll still be able to see her smiling face! A padded bodysuit comes in black, this costume features skeleton bone details printed on the front and arms. Wings also have bone details and extend to either side. The headpiece features a little bat skull and ears, and will transform him or her into the spooky Skeleton Bat. A pair of black leggings (sold separately) are a great way to complete the costume style! Whether you're shopping for a little one's first Halloween, or for an older child, or even for an adult, we're all about making sure we have a huge selection of options. From spooky to sweet, we've got it all, and everything in between. Shop our entire selection to take care of all your Halloween needs!